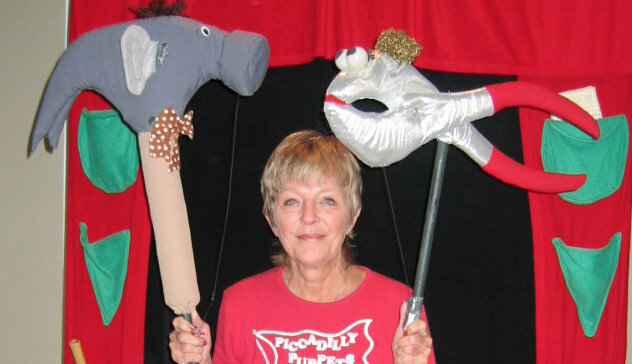 Long-time Director of the Piccadilly Puppets, Carol Daniel Klein, passed away in June of 2011. Born in Minnesota, she studied speech and speech therapy in college. She began working with the Piccadilly Puppets Company in 1974, helping with the administrative duties. Soon afterward, a puppeteer abruptly quit, and Carol stepped in. From that point on, she was the heart and soul of Piccadilly Puppets, becoming the Director of the Company in 1980. Carol also produced several shows for other organizations, including Northside Hospital, and the Cobb County Youth Museum. She worked with puppets in television, as producer, and as the Director of Puppetry for programs with puppets for GPTV. She was active in Puppeteers of America and UNIMA, the international puppetry organization. She directed and performed at puppetry festivals on a regional, national, and international level. She was awarded the UNIMA (the puppetry “Oscar”) for one of her Piccadilly Puppets shows.